We’ve made it easier than ever to operate your Roller blinds with our handy motorised control system. Now you can effortlessly open and close your blinds all with the touch of a button. It’s perfect for skylights and other hard-to-reach windows too. 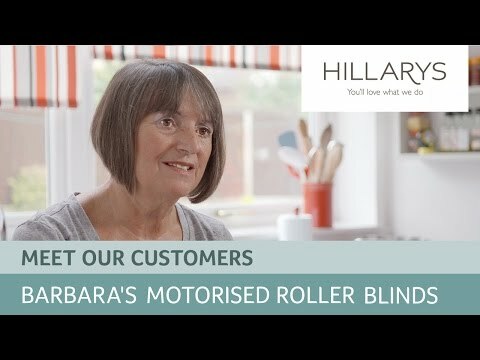 If you’re considering new blinds for your home, take a look at our short video following Barbara’s story. Having recently renovated her kitchen, Barbara wanted a blind to suite with her new colour scheme and it had to be the perfect finishing touch to her room. The striped design was just what she was looking for and she couldn’t be happier with her new motorised blinds. Hillarys MotoPleat™ collection is ideal for large conservatories with lots of windows in the roof. If you’re choosing Roller blinds for a large room with lots of windows and doors, or buying several Roller blinds for a bay window, you’ll love our new motorised control system. With a single remote control you can operate your Roller blinds quickly and easily, all from the comfort of your armchair. Our electric Roller blinds are especially good for hard-to-reach windows, such as roof lights and skylights, and because there are no operating cords or chains, they’re ideal for homes with young children too. And if you have a conservatory, you’ll be pleased to know we have a motorised option for you too. Our MotoPleat range of motorised Pleated blinds is specially made for conservatory roofs, and comes in a range of performance fabrics to help you control light and temperature. Your in-home advisor can offer you expert advice to help you choose the perfect Roller blind from hundreds of gorgeous plain and patterned fabrics. Once you’ve selected your favourite we’ll measure your windows to make sure your made-to-measure motorised blinds fit perfectly. On your fitting day your advisor will show you how to use the remote control system, so you feel totally confident operating your new electric blinds.